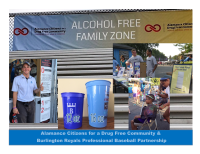 Alamance Citizens for a Drug Free Community (ACDFC), a 501c3 nonprofit organization, is the lead organization in the community to address the prevention of underage drinking and prescription and over the counter medication abuse. ACDFC utilizes proven prevention strategies that positively impact the health and social well being of individuals and the community. ACDFC works closely through a coalition of members representing numerous sectors of the community including those from local health and human services, public and private school systems, Elon University, Cone Health-ARMC, the public health department, the faith community, parents, law enforcement, media, businesses, and elected officials as well as other groups or organizations with similar goals and missions. ACDFC develops and implements public health strategies that are science-based and are designed to impact the social climate that encourages, supports, reinforces, and sustains problem use of drugs. These strategies are designed for community improvement that lead to a reduction in risk, prevention of exposure to problems and awareness building outcomes. Alcohol is the number one drug of choice among teens and nationally kills more teens than all other drugs combined. In 2017, over one in five high school age students in Alamance County reported using alcohol in the past 30 days and the average age of first use was 13.8. Alcohol misuse or abuse is often associated with dangerous behaviors such as assaults, sexual assault, robbery, domestic violence, unintended pregnancies, child abuse and property crimes. It is often a contributing factor to premature death by homicide, suicide, drowning, fire, motor vehicle or health failure. Alcohol is also as a risk factor for cancer and is directly attributed to fetal alcohol spectrum disorders. Few commercial products impose a greater economic burden upon society, a cost ultimately borne by taxpayers. For teens there is no such thing as a safe drink of alcohol because of the still developing brain and body. Research shows that young people who start drinking before the age of fifteen are five times more likely to have alcohol-related problems later in life and a child of an alcoholic parent is four times more likely to become an alcoholic. Children who live in substance abusing homes or who have friends that abuse alcohol and other drugs are at much greater risk of using or becoming drug dependent. Risk factors can be countered with protective factors: youth who engage in positive activities, are connected to consistent, reliable adults in the home, school, and community, drug education for parents and prevention programs for children as young as preschool. 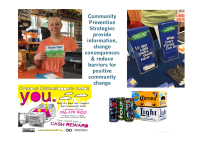 Strategies utilized by the coalition include conducting alcohol purchase surveys and Responsible Seller Training with local retailers, coordinating a multijurisdictional law enforcement team that implements county-wide alcohol compliance checks and other alcohol and drug enforcement operations, implementing social marketing campaigns with the goal of changing community norms, providing community education and awareness activities as well as advocacy efforts aimed at changing, increasing or developing policies, practices and laws that impact the problem. 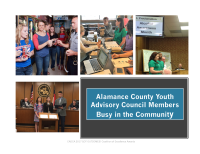 The Alamance County Youth Advisory Council (ACYAC) is a group of high school students that meet twice monthly to focus on underage drinking. Using their training in leadership, public speaking, advocacy, and media literacy, they serve as peer leaders and community educators in conducting speaking engagements, planning community campaigns, implementing Town Hall Events and advocating for policies and laws that address underage drinking at the local and state level. Prescription and over the counter medication safety is a critical factor to our community’s health. Prescription and medicine abuse can be explained, in part, with the ease of access in the home. In a recent Elon University poll conducted with 744 individuals in the county who were over the age of 18, 64% admitted to not locking up prescription medications in their homes. In addition, anecdotally we know that many believe that because prescription and over the counter medicines are legal, it must be safer because it is prescribed by a doctor and dispensed or sold at pharmacies or stores. Locally, there is growing concern that this category of drug abuse will continue to rise with the increase of opioid overdoses. Data shows that the number one cause of injury death in Alamance County for people ages 15-34 is unintentional poisonings where the clear majority of these are drug or medication-related. (N.C. Injury and Violence Prevention Branch). ACDFC has organized community partners to provide two community forums to raise awareness on this issue and develop strategies to impact the problem. 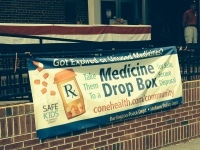 It has also provided training to parents, youth, and older adults, facilitated the installation of four permanent medication drop boxes in local police departments, assisted with the provision of training to local prescribers on safe prescribing practices for pain medication, supported medication take back programs and conducted a comprehensive county prescription opioid assessment. 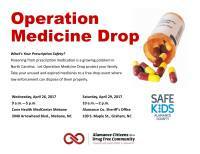 Like the Community Coalition to Prevent Underage Drinking, the formation of the Alamance County Rx. Drug Abuse Prevention Task Force brings an array of sectors to the table to develop strategies that address prescription and over the counter medicine safety in the community.